The 1965 film would cause the Sangh Parivar to take major umbrage at its inter-faith romance. 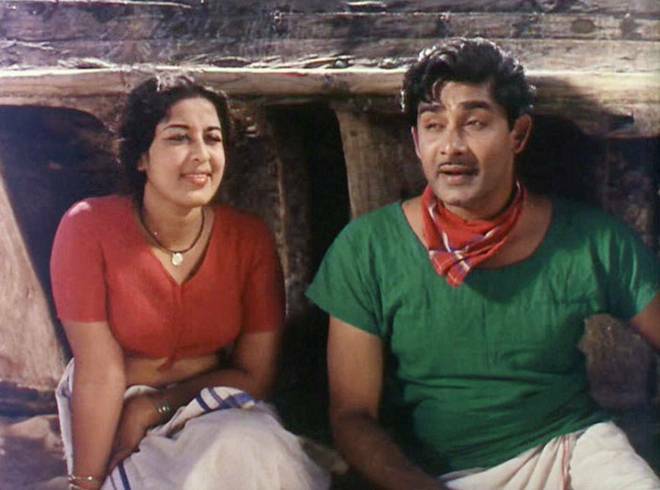 Chemmeen, the 1965 Malayalam-language movie needs no introduction to any Keralite. This movie-adaptation of Thakazhi Sivasankara Pillai’s eponymous novel is a Malayalam cinema classic that weaves the story of the tragic romance between Karuthamma (the daughter of a Dalit Hindu) and Pareekkutty (a Muslim trader), set in a tiny fishing village in coastal Kerala. What if Chemmeen were to be first released in the present day? If the recent “review” of Angamaly Diaries aired by Janam TV – a pro-Sangh Parivar Malayalam TV channel – were any indication, then Chemmeen would have been in for a rough ride. Angamaly Diaries was one of the biggest box-office successes of 2017, apart from the immense critical acclaim it received from even outside Kerala. However, Janam TV’s film critic chose to trash the movie – and he is well within his rights to do this as a film critic. However, the review ended up being cannon-fodder for the famed Malayali social media satire, due to its blatantly communal colour. The review, for example, criticised the movie for “showing too many visuals of churches” and even went on to ask whether there aren’t any temples in Angamaly, the real-world town the story is set in. It appeared to be lost on the reviewer that the movie IS about a group of Christian youth in Angamaly who set out to float their own pork-meat trading business. Or perhaps it was not lost on him at all. Kerala in 2017 stands tall like the little Gaul village of Asterix and Obelix – a perpetual thorn in the side for the rampaging legions of Caesar Amit Shah. Be it the state’s chief minister Pinarayi Vijayan or Congress politicians like Shashi Tharoor (the sitting Lok Sabha MP for Thiruvananthapuram) or Malayalam social media’s top political satirists like International Chalu Union – nobody misses an opportunity to push back and lampoon the Sangh’s attempts to impose their version of religiosity and “sanskar” on Kerala. What would a young Sangh-supporting intellectual do in Kerala? Nothing much, other than cheer wildly about election results from faraway places like Bundelkhand and Kota. As far as career ambitions go, their best bet would be to butter up BJP’s North Indian bosses and hope to land a job in Prasar Bharati. Or maybe in CBFC, if Pahlaj Nihlani’s successor too manages to get himself fired. If Chemmeen were to make its first appearance now, how would Janam TV see it? By the looks of it, they might jump at the opportunity to trash it, and perhaps even get it banned. And why not? It has every ingredient that rubs a Sangh supporter the wrong way: a Hindu-Muslim love angle (“love jihad”), extra-marital love, glorification of local fables, and worst of all, fish-eating (the movie’s name itself translates to “Prawn”). World cinema is dotted with works that tell the stories associated with the sea. Jaws, Titanic, Sharknado 1, Sharknado 2, Sharknado 3 are some of the most renowned in this category. None of these are merely sea yarns shouted from the rooftops; instead, they narrated global issues in a sea-setting. Titanic, for example, told the story of post-colonial Anglo-Irish immigration to America, couched as a love story on board an ocean liner. Jaws and all the Sharknado movies were stellar advertisements for ocean conservation and beach tourism, apart from being great action-thrillers. However, when it comes to Chemmeen, things turn upside down. All that the Sathyan and Sheela starrer does is to glorify the lives of a bunch of fisherfolk in a tiny fishing village called Purakkad in Kerala, as if they were great seafarers from the Vedic era. Does the village of Purakkad have any historical, cultural or political significance in Kerala? One wonders whether the producer Babu Ismail Sait had any role in deciding to ignore the more historically, culturally and politically significant fishing villages in Kerala, such as Marad (communal rioting in 2003) or Poonthura (communal rioting in 1992). What Chemmeen does is to portray such an insignificant village and its people in the mould of glorious ancient seaside towns like Rameshwaram. A small fishing community, of the kind one would find in most seaside villages, their day to day trials and tribulations, songs, dances, moral decadence — this is the gist of Chemmeen. The movie’s technicians have succeeded in giving a colourful facade to an inherently weak story using professional editing and decent outdoor shoots. The author Thakazhi Sivasankara Pillai should give serious thought to his future as a novelist. Chemmeen continues the un-Indian trend in Malayalam cinema of glorifying meat- and fish-eating. The last decade has seen a deluge of Malayalam movies that glamourise meat eating. Angamaly Diaries glorified pork eating to such an extent that opportunistic restaurateurs have started pairing even pure indic food items such as idly and dosha with pork varattiyathu — an abomination that was otherwise paired only with deracinated and un-indic food items like appam and pathiri. A meat sub-culture is growing in Kerala and the prime culprit is cinema. Chemmeen is director Ramu Kariat’s contribution to this carnivore-isation of Malayali youth. The movie is littered with seafood symbology from the beginning to the very end. There is even an elaborate sequence where Karuthamma (the female lead played by Sheela) serves rice and copious quantities of fish curry to Palani (played by Sathyan). Hasn’t Thakazhi heard of more traditional Kerala food such as rice, sambar, aviyal and puzhukku? Are there no vegetables in Purakkad? Even the songs — couched as folk songs — are actually nothing but inane glorification of seafood. The lyrics are replete with words “karimeen”, “chakara” etc and that too set to close up visuals of fresh fish. The highly impressionable youth of the communist-ruled state cannot be blamed for flocking to seafood joints after every screening of the movie. Paragon Restaurant in Kozhikode for example, has reported a 300 per cent increase in their number of fish-mango-curry orders ever since the movie released. By the time the movie ends one begins to get alarmed, wondering if Kerala is some kind of Republic of Fish Eaters, totally disconnected from vegetarian India. The only bit where Thakazhi and Ramu Kariat deserve praise is for their willingness to expose the menace of “love jihad” that is spreading all over Kerala. Pareekkutty’s (has to be short for Fareed Kutabbudin) character, played by Madhu, demonstrates the depth to which jihadis go to infiltrate our communities to cause wide-ranging issues ranging from marital discord to economic downturn. This is the only saving grace amongst all the cacophony about “sea”, “karimeen”, “chakara” and immorality that make up the glorified sea-trash called Chemmeen.